These gloves feature a micro-roughened finish on the surface of the glove for a non-slip grip in wet and dry conditions. 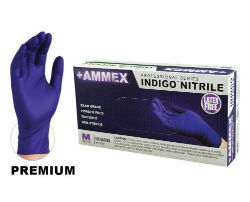 AMMEX Indigo nitrile is a premium quality disposable glove that provides excellent chemical and puncture resistance, superior comfort, strength, tactile sensitivity, and protection. Powder-free, so messy residue is not a concern when working with fresh paint, seals, adhesives, or ink. For home use, these indigo nitrile gloves are a versatile and durable choice. They can be used indoors or outdoors, in the kitchen or garage. Ideal for lawn equipment or car repair and maintenance, heavy duty cleaning, home maintenance and repairs, painting and plumbing, yard work, arts, and crafts. Works great as exam gloves for pets, horses, and livestock.